After the wet summer and winter of 2017 many farmers struggled to utilise grass on their farms due to excessive water. Removing this water from the soil not only makes it easier to access fields but can improve crop growth and reduce greenhouse gases emitted from the soil. Seamus Donnelly (SAC Stranraer) will be our key speaker during this event. He will discuss how to improve the water f low through your soil and will artificial drainage – looking at both new systems and updating old systems. He will also explore how to minimise and alleviate soil compaction. 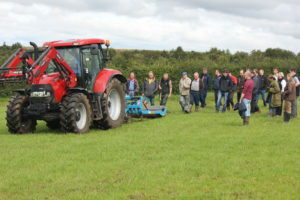 This part of the meeting, to be held in Arran High School will be followed by a short journey to Arran Show field to see some compaction alleviating machinery in action. For more information about this event, please call our FAS Advice Helpline number on 0300 323 0161 and ask to speak to either Seamus Donnelly or Andrew Taylor. Please use the booking form below to secure you place.